Dr. Stephen Strange is freezing. You’d be cold, too, if you’d just been transported to the side of Mount Everest by two powerful sorcerers. But on February 1, 2016, day 54 of the 87-day shoot of Marvel’s Doctor Strange, the would-be sorcerer figures out a spell to bring him back to Kamar-Taj, the home of the Ancient One. And he’s bringing a whole new side of the Marvel Universe with him. Instead, Marvel’s 14th film will introduce audiences to Dr. Stephen Strange, a cocky, ultra-successful New York neurosurgeon (Benedict Cumberbatch) who gets into a terrible car accident and loses the use of his hands. He then travels across the globe, hoping to find some method of restoring them, but instead meets the Ancient One (Tilda Swinton). From her, Strange begins to learn about a whole new world of sorcery, mysticism, and multiple dimensions. Cumberbatch and director Scott Derrickson. Cumberbatch and Baron Mordo (Chiwetel Ejiofor) work with the sling ring, kind of a sorcerer’s magic wand. The scene begins with the Ancient One standing in the middle of the set, which is fully formed on three sides, about 50 yards wide and probably 50 feet high all around. Every inch is detailed, weathered, and constantly sprayed with water by crew members to keep it looking as old and musty as one would imagine. The Ancient One and Mordo look on as Strange returns from his journey. This is the scene we were on set witnessing. “We shall see, any second now,” the Ancient One replies. “Maybe I should…” and just as Mordo finishes that, a portal begins to open, and they both smile. It’s Stephen Strange, in thin gray wraps, his beard covered in snow and ice, conjuring a portal by making a circle with his hand. He then stumbles through, falls to the ground in Kamar-Taj, and looks up in shock. Though it sounds like a seemingly simple scene, Derrickson shot it for about five hours. Different falls, angles from behind and around every character. Over shoulders, from the ground. The left, the right. Having an immersive set like that allows for this. And while there isn’t an actual portal there, there is an LED light circle, about six feet tall, that blinks for Strange to walk though and will later be enhanced with digital effects. Why is Strange cold and icy? Well, here’s why. If you’re already a fan of Doctor Strange, you’re probably thinking, wait, isn’t Baron Mordo a villain? He’s one of Strange’s biggest foes in the comics, but in this movie universe that hasn’t happened... yet. (No one was shy at hinting that could be the plan in sequels.) Instead, the villain is Kaecilius, played by Mads Mikkelsen. Kassilus is a fellow sorcerer who “has a philosophical break” from the others, according to Feige. And though he’s not a well-known Marvel character, Derrickson hints he may not be working alone. “From the beginning, I was pitching an antagonist who was rooted in the real world,” Derrickson said. “So that there could be an intimate relatability between Strange and his adversary, but who was empowered by something else. Something otherworldly. And I’ll say this—another character straight from the comics.” Derrickson likened this mysterious relationship to Sauron and Saruman in Lord of the Rings, sort of a master-apprentice thing. Benedict Wong as Wong, in a sliver of a new character poster from the film. Strange and Christine Palmer (Rachel McAdams) share a moment in the hospital. She was not on set the day we were there. So while there will be some of the expected lightning versus lightning throwing, Derrickson really wanted to get away from action beats people had already seen. Cumberbatch and Derrickson share a moment in the Sanctum Sanctorum. 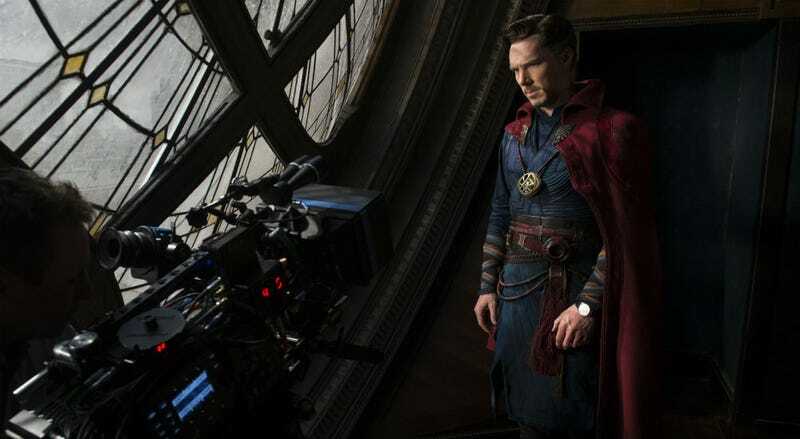 With location shooting in Nepal and Kathmandu, and on multiple stages in London and even New York, Doctor Strange promises to do what Marvel does best. Prove that a good character will drive a good story and, in the case of Dr. Strange, hopefully even drive a whole new dimension. Note: Disney paid for io9 and Gizmodo’s travel to London to visit the Doctor Strange set.